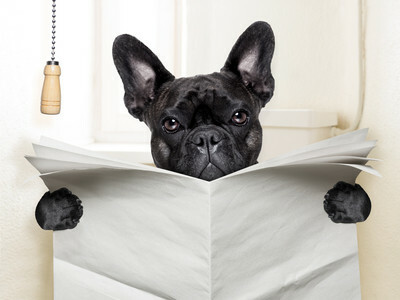 Housebreaking/toilet training a puppy is not easy; it takes time and a lot of patience! When you first introduce your puppy to your home, carry her to the spot where you want her to go and lead her around on a leash. It’s a good idea to have a strong verbal command like “Toilet” so you can eventually train your dog to “go” on demand. Treat and praise them every time they go outside. At about 8 wks old puppies usually sniff for a scent (either their own or another dog’s) to pee over so you could have a friend’s dog come and pee in your garden or collect your own puppy’s pee and deposit that in the area you want her to go. Most young puppies have to eliminate about every 30-45 minutes except when sleeping. Their elimination schedule will depend upon when they last ate or drank, physical activity and natural preference. Keep your puppy on a consistent daily exercise and feeding schedule (what goes in on a regular schedule should come out on a regular schedule). Remove food between meals so your puppy’s elimination schedule does not become random. Take them outside on a consistent and frequent schedule, especially first thing in the morning, last thing at night, after feeding and play and before being confined or left alone. Every puppy is different, some eliminate immediately after eating and others could take 30-60mins. Always leave water out for your puppy. Check the water bowl frequently to note how much she is drinking and to make sure the water bowl is full. A crate – a metal collapsible crate that your puppy can grow into is ideal – it has to feel like a den. Or a small room with a baby gate. Not too big, or your puppy might learn to soil in one corner and rest elsewhere but large enough for them to lie down comfortably, stand up, turn around and stretch. Toys and a bed or blanket so the crate is inviting – your puppy needs to accept the crate as a safe and cozy place. Odour eliminating cleaner for carpets and fabrics – your product needs to neutralize the smell so your dog won’t re-mark the same spot. We recommend Odorex® Animal Odour Eliminator. Treats/rewards – something small and special, reserved and used only for house-training. Place the crate in a living area e.g. the lounge so your puppy doesn’t feel isolated and put food and water bowls in there along with a soft blanket or towel to make it cosy. and start sleeping in the crate right away. Encourage them by dropping some small food treats or a toy in the crate. A good time to crate your puppy is after you have exercised them e.g. after their morning walk – they should be sufficiently tired and have gone to the toilet. Again, gently lead them into the crate with lots of encouragement and include a treat. Pat your puppy, let them chew a toy in your hand etc. and once your puppy looks relaxed you can close the door. Stay a while to ensure they are settled and then you can leave. If your puppy whines when crated you must ignore it, they should quiet down after about 20 minutes if you haven’t paid them any attention. 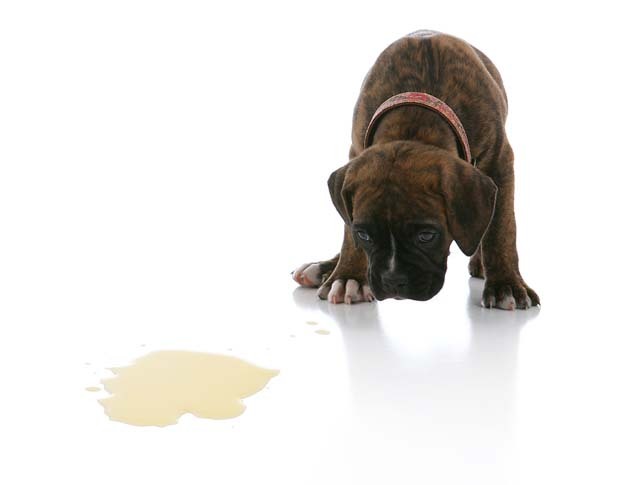 After rest your puppy may bark or whine, start to sniff the ground in little circles, pant or raise their tail – all/any of these signs indicate they may need to eliminate so quickly take them out and to the spot where you want them to go. Take them outside at least every hour (except when sleeping at night) and always immediately upon waking up, after meals, big drinks of water and excited play. Once outside, use your verbal command and if they go praise/treat them (affection, play and walks can be treats too). It’s best to take them to the same spot so the smell can help prompt them but some dogs need to walk around a bit first before they need to go. If your puppy does not eliminate within about five minutes, return her to her crate and try again in about 15 minutes. Don’t bring th em inside right after they eliminate or they might learn to “hold it” so they can stay outside longer. Wait for them to eliminate and then go for a fun walk or brief play before going back indoors. Once inside do not give your puppy free run of the home until they are housebroken. Close bedroom, bathroom doors etc. so that you can always see your puppy or use baby gates to restrict access. Start with about 15 to 20 minutes of free time and if all goes well, gradually increase the amount of time your puppy spends out of their confinement area over the coming days and weeks. Puppy bladders are small and until about 4 months they have no control over when they eliminate so if an accident is about to happen you need to act quickly; clap your hands (just enough to startle not scare) move quickly towards them and pick them up and take them outside to the right spot. If your puppy then goes outside, praise and treat them. If your puppy is pooping then let them finish as they are not able to shut this off like pee. After about one month of training (your puppy should be about 3 months old) they should have developed enough bladder and bowel control that you can lead them outside on a leash rather that picking them up. If you don’t catch your puppy in the act – do not react! Clean up the mess immediately (urine can quickly soak through carpet to the floorboards making cleaning up harder) with paper towels and your odour eliminating product. You can try using a black light torch to locate older messes and treat those areas too. If you puppy suffers from separation anxiety you may need to move the crate near your bed at night for the first couple weeks. There are many different techniques to house-train your dog or puppy and each animal will respond differently but with patience and a consistent approach you will succeed. For an older dog – follow these tips.